Yes that was what I was thinking in week 1-4. Why the hell am I doing all this reading and thinking? When is the change going to happen? Where the hell is my Ferrari, and why is it not in my garage!!! Then after reading even more it finally hit. I am changing, but the change happens through natural law. But thought works no magic transformations; it obeys natural laws; it sets in motion natural forces; it releases natural energies; it manifests in your conduct and actions, and these in turn react upon your friends and acquaintances, and eventually upon the whole of your environment. You can originate thought, and, since thoughts are creative, you can create for yourself the things you desire. I felt at first that I was not making the change needed to complete the course. That I was sometimes just reading the same stuff over and over. What a mistake that thought was. It was during a deep thinking time I had on Monday. My thoughts create my future. Not my present but my future. The future I am experiencing now was from some past thinking I had days, months, possibly even years ago. So this is what I have been doing the last couple of weeks. Designing my bridge to get from my starting point to my purpose in life. But it works in this way. Imagine a bridge that is curved like a rainbow. In the beginning the thoughts seem to have little impact, but as the thoughts and feeling get stronger so does the bridge. 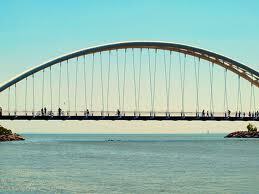 Before the MKMMA, i build my bridge on the thoughts of everyone around me. Again, this mind which pervades our physical body is not only the result of hereditary tendencies, but is the result of home, business and social environment, where countless thousands of impressions, ideas, prejudices and similar thoughts have been received. Much of this has been received from others, the result of opinions, suggestions or statements; much of it is the result of our own thinking, but nearly all of it has been accepted with little or no examination or consideration. But now I have started to create a new bridge. I am not able to get across it yet, but i can see the other side a little more clearly. The design is happening within me. So, as the first bridge I built is arching down, the new bridge I am building is beginning to arch upwards and become stronger. The point they intersect, will be the point of no return. I see that just a few steps ahead. This week has been an amazing week. I have finally seen the fruits of my labor with a few sales and I am excited to move forward. Much wisdom and tons of insight Brian. Onward! Getting clear on where you are going is so helpful 😉 The work you are doing now will produce a harvest! I have been wondering where my Mercedes is!! Thank you for your thoughts on building the bridge, your insights are so helpful. Funny! But it is there. Just takes natural law to manifest it :). Always happy to help thanks for the nice comment.